Microsoft has finally unveiled the successor to the popular Surface Pro 3 at its NYC hardware event today. As expected, it’s called the Surface Pro 4 and it comes preloaded with Windows 10, but it also has some interesting new tricks up its sleeve. It has a fingerprint sensor for fast login, a 12.3″ PixelSense display and a new ‘hybrid cooling system’ for keeping the device cool. That PixelSense display is now 267 PPI, the highest resolution display found on a Surface device yet. A new pen to go with the device has 1024 points of pressure, as well as an eraser on the back. Microsoft also added a magnet, so you can store it on the side of the service without crappy pen loops. It’ll be available in five colors, with interchangeable pen tips, depending on what you’re using it for. If you push and hold on the pen’s eraser, it pulls up Cortana so you can ask a question or double click the eraser and drag over a window to take a screenshot. The new Surface Pro 4 has the latest Intel Skylake chipset which Microsoft claims is 50% faster than the current-generation MacBook Air and is about the same size as its predecessor, just slightly thinner at 8.4mm. There’s also an improved new keyboard, which features scissor keys like Apple’s new MacBook to save space and make it easier to type. It’ll be available in five colors. A new Surface dock allows you to attach it to a workstation and features four USB 3.0 ports, two 4K display ports and ethernet over a single USB port. It’s also compatible with the Surface Pro 3. 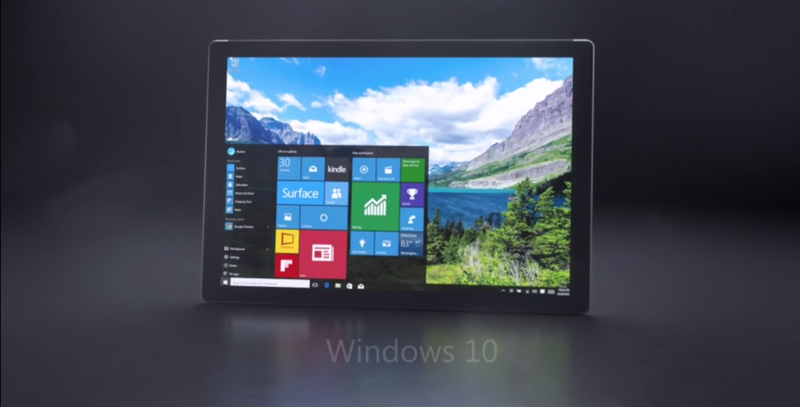 Surface Pro 4 will be available in models with up to 16 GB of RAM with 1 TB of storage. It’ll start at $899, with pre-orders opening tomorrow. It’ll be available on the 26th of October.